The Andalusian capital of Seville is always a great holiday destination, thanks to its hot climate, delicious food and drink, plus beautiful city architecture reflecting over 2,000 years of Spanish history. 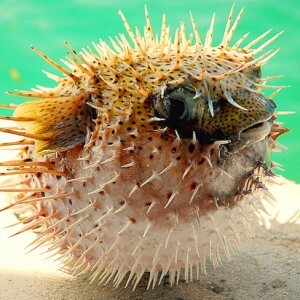 But perhaps the most interesting times of the year to visit are in March and April, where two very different public festivals take place – Semana Santa and the Feria de Abril. 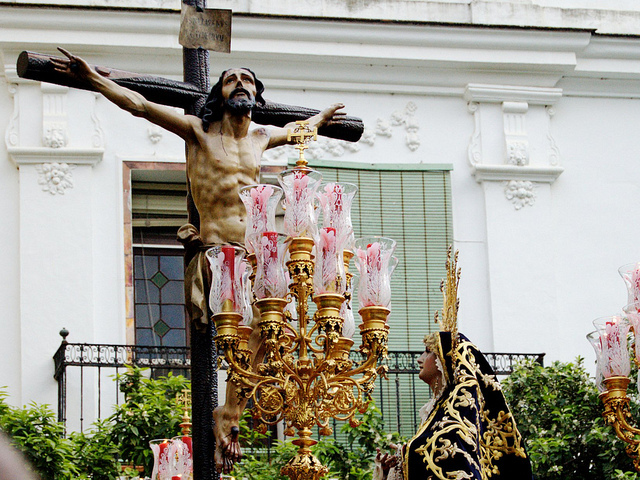 Known by the rest of the world as Holy Week or Easter Week, Semana Santa is a far bigger deal in Seville than many other places in Europe, except perhaps Latin America. 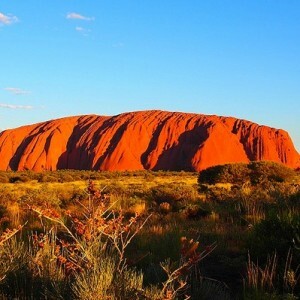 Visitors flock to the city, while residents line the streets on every night of the week leading up to Easter Sunday, waiting to catch a glimpse of the 60-odd processions that take place. These feature pasos, or floats, bearing ornate wooden sculptures of the Passion and the Saints, especially the Virgin Mary. Many of these sculptures are centuries old and of great spiritual significance to the average Sevillano. 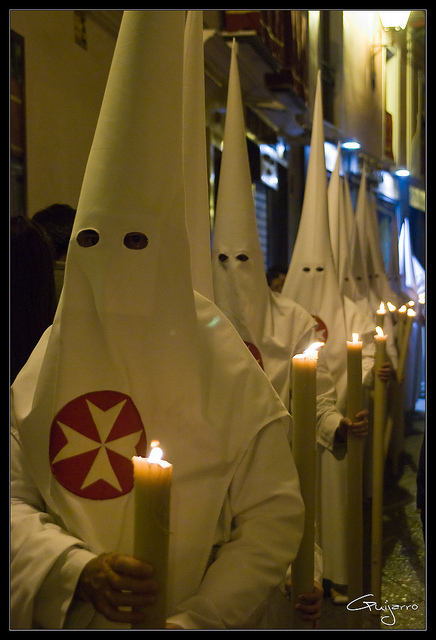 Perhaps more bizarre to the visitor are the followers of the processions, made up of members of the local Catholic hermandades and cofradías, the religious brotherhoods. 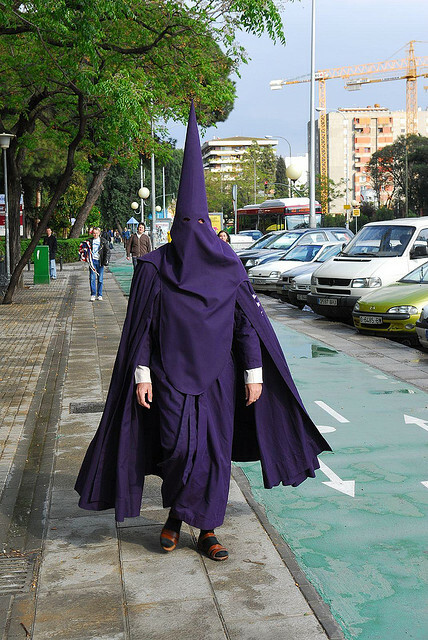 While some make up the brass bands playing funereal dirges, others bear the vast weight of the pasos and most are the nazarenos, penitents dressed in full robes and hoods, and looking uncannily sinister to the uninitiated. You can see entire families dressed in this garb, colour-coded depending on which brotherhood they belong to, and it is not unusual to see a group relaxing at a café over a beer once the processions are over! 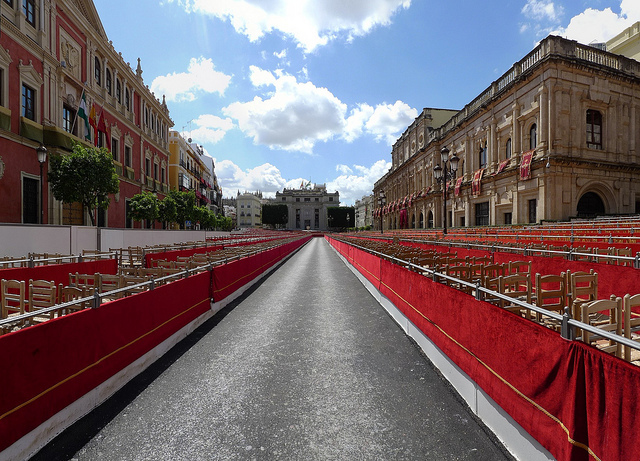 The processions follow various routes from the local churches in question, but all eventually converge on Seville’s impressive central cathedral – they can take up to 14 hours to get there and back! 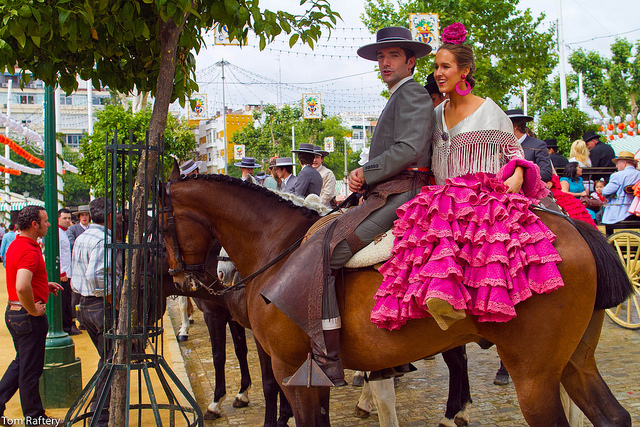 Just a couple of weeks after Semana Santa comes Seville’s second great public event, the April Fair, or Feria de Abril. 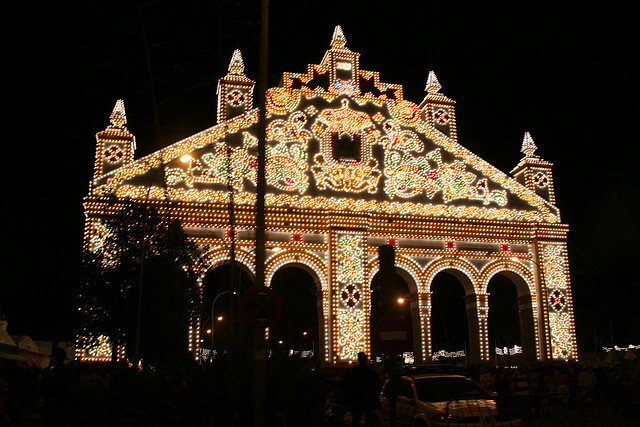 Starting at midnight on the Monday, a giant ‘gate’, is lit up and heralds the opening of the mediaeval fairground across the river Guadalquivir, which is transformed into a mini “town”, complete with street signs and a map. This will be the destination of untold numbers of Sevillanos for the next six days. 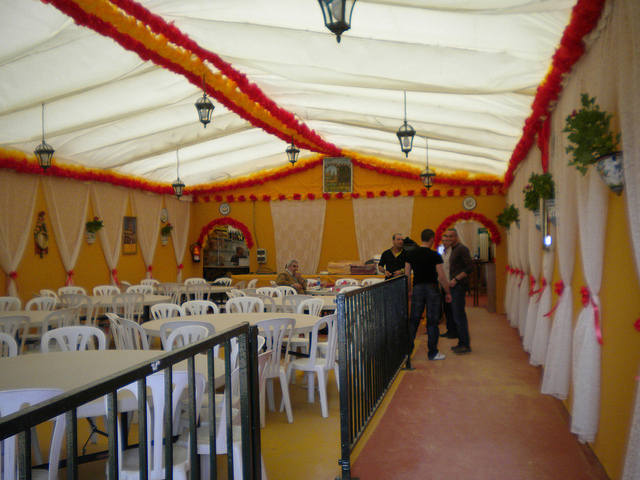 The fairground is composed of hundreds of casetas – small-to-large decorated marquees which have their own kitchen, bar, musical stage and doorman. 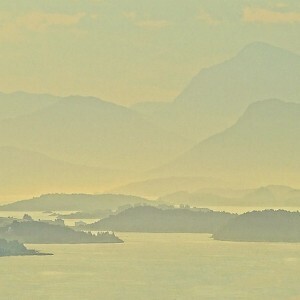 They are either owned by prominent local families, companies, trade associations, municipal bodies or political parties, which depends on whether they are open to the general public or invitation-only. 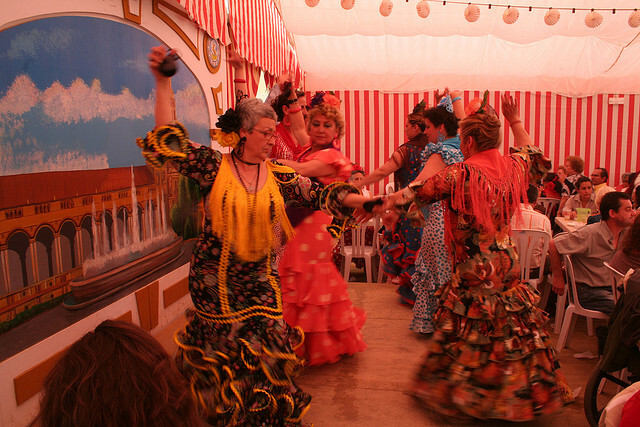 Inside is a riot of eating, drinking, dancing (to the local “Sevillanas”) and general revelry. 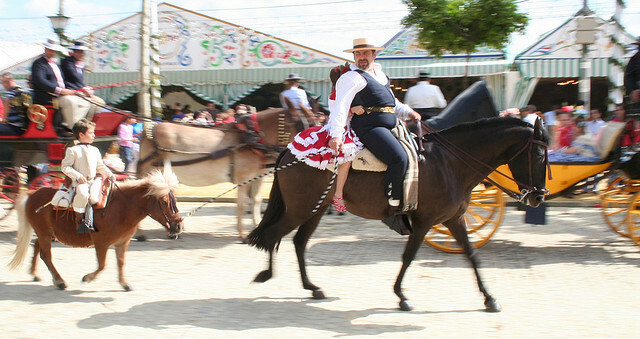 Other features of the Feria are the bullfights which take place daily at the Plaza del Toro, and the parade of carriages and riders, looking magnificent as they pour sherry on the hoof, resplendent in their equestrian gear. 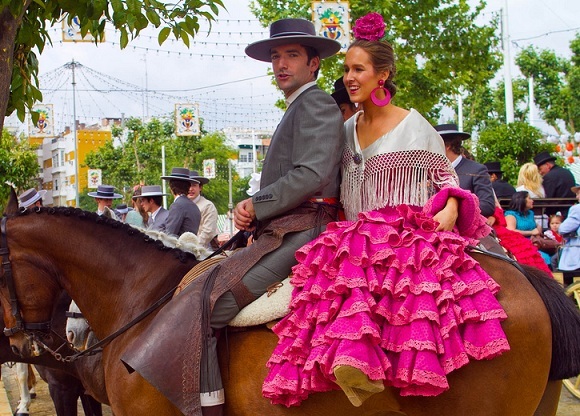 The real stars of the Feria, however, are the women of Seville. 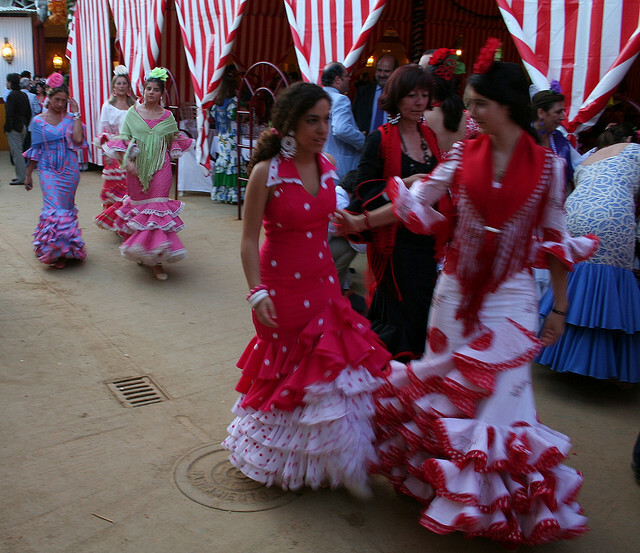 While the men opt for smart suits or the traditional traje corto – a short jacket, tight trousers and boots – the women dress up to the nines in flamenco dresses, with traditional hairdos and flowers in their hair. Fashions for these trajes de flamenco vary each year, and it is truly something to see the riot of colour and pattern that all these different dresses make.